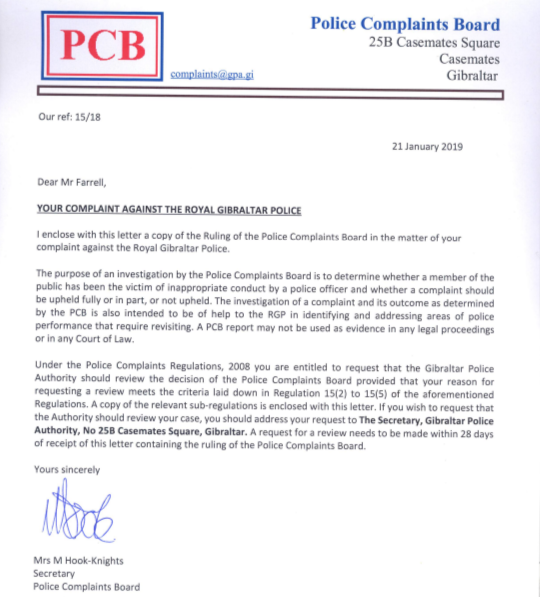 In accordance with the Police Complaints Board Regulations 2008, this report requests that the Gibraltar Police Authority review the decision of the Police Complaints Board (15/18) with reference to my complaint about the actions of the Royal Gibraltar Police on 10th September 2018. As the complainant, I consider the decision of the Police Complaints Board, and the investigative practice of the sub-committee, as presented to me on 21st January 2019, as manifestly wrong, and perverse. I assert that no reasonable Board properly considering the complaint could have come to such a decision. In summary, I believe that The Gibraltar Police Authority should review the decision of the Board based on four reasons. For the sake of all the people in Gibraltar, not just in your current capacity as chair of the Gibraltar Police Authority, but also as a former fellow student in the Biblically prophetic important city of Sheffield, please would you personally review those four reasons? 1. There were clearly four distinct elements to my complaint, as itemised in the final paragraphs 92 to 95 of my original report which was hand-delivered to Elka Hanglin on 18th September 2018. 2. It is evident from the eventual response received from the Police Complaints Board, dated 21st January 2019, that the investigation had been limited in its scope, and was therefore both incomplete and unfit for purpose, in so much as two of the four elements of my complaint were not even mentioned, let alone investigated properly. 3. It is asserted that by far and away the two most important and deadly serious elements of my complaint have been deliberately ignored by the Police Complaints Board. 4. 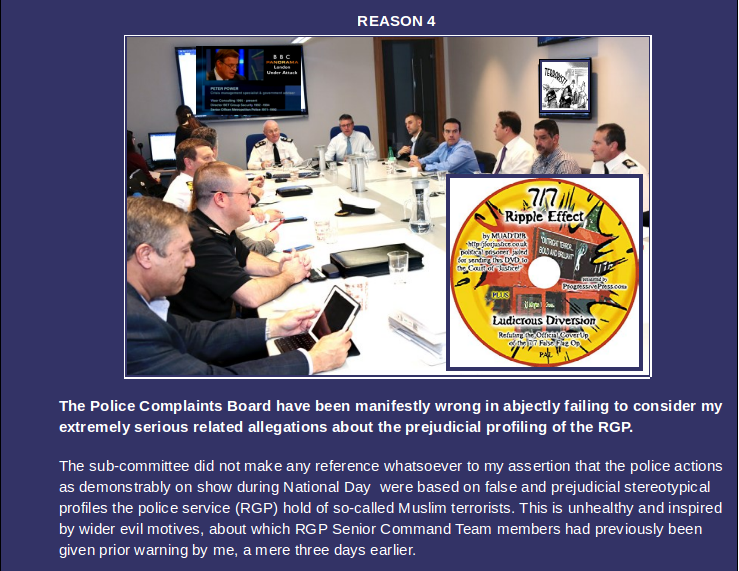 Given the nature of the original stop, search and detention, as performed on me on 10th September 2018, it is a glaring omission of the sub-committee to have consciously or otherwise made no mention whatsoever of the actual 7/7 Ripple Effect 2 DVD. This is the DVD found in my possession on National Day. It is the same DVD which was raised by me as a major concern within my original complaint. 5. The Police Complaints Board sub-committee have abjectly failed to deal with my assertion that the actions of the two police officers were based on false and prejudicial stereotypical profiles the police service (RGP) hold of so called Muslim Terrorists. 6. The abject failure of the sub-committee to consider the complaint IN FULL, as a collective whole, and therefore deal appropriately and fairly with all four elements, including points 94 and 95, and not just cherry-pick points 92 and 93, which is what they have plainly done, amounts to nothing short of a dereliction of duty on behalf of each and every one of those investigating members of the sub-committee. 7. On this basis, each and every one of the investigating sub-committee ought to be sacked, as at best they are totally incompetent, or at worst, they have already made themselves complicit in an extreme case of evil, and they are therefore corrupt. 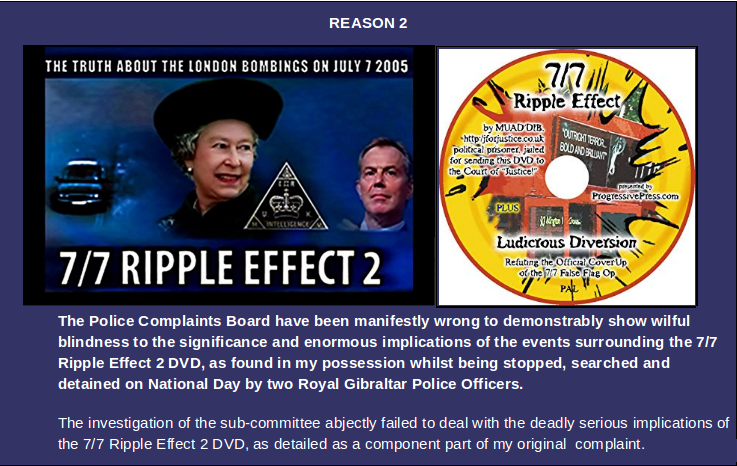 REASON 2 – The Police Complaints Board have been manifestly wrong in showing wilful blindness to the significance of events surrounding “The 7/7 Ripple Effect” DVD, as found in my possession, whilst being detained on Gibraltar’s National Day. 8. Evidence that the DVD was raised initially with the Police Complaints Board is provided in paragraphs 52, and 77 through to 87 of my original report as replicated in the table below. (77) Back in paragraph number 52, I mentioned one other vitally important item I had in my possession during the search. That happened to be a DVD of Muad’Dib’s “7/7 Ripple Effect 2”, about The Truth behind the false-flag London Bombings of 7th July 2005. (78) Early on in the search, the male police officer looked closely at the front cover of the DVD, and read its title, but abjectly failed in his duty to ask me a single question about it. The question has to be asked, “Why not?”. After all, this was a DVD about terrorism, and mass murder, and what is more, I had been caught red-handed with such an item in my possession. (79) Here’s the clincher. Had the police officers’ motives been genuine, how did they not have a duty of care to the public, under Project Servator, to probe me about the DVD and its contents, with at least the same rigour as they had probed me on other such matters of a private and personal nature? (80) Their abject failure to exercise that duty of care to the public, given the initial nature of the stop and search they were supposedly performing on me, demonstrates the sheer hypocrisy and folly of Project Servator’s façade, all in one fell swoop. (81) For just like Muad’Dib’s film had exposed the false narrative behind the false-flag 7/7 London Bombings of 7th July 2005, so too did His DVD label now shine The Light on Project Servator’s disingenuous objectives, and the false terror threat sham laid bare before the two RGP police officers. (82) Given that I’d been stopped and then brought into the station specifically because of the terrorism threat, it seems very ironic indeed, that, when the male police officer, who caught me red-handed possessing a DVD specifically about terrorism, and terror attack bombings in London, somehow and in some way, saw fit to completely disregard its relevance to the reason for my detention. (83) Why did neither of the police officers examine the content of the DVD, if they genuinely stopped me because of the terror threat? (84) Why did the police officer not arrest me immediately upon seeing this DVD, on suspicion of possessing terrorist material? (85) Surely such an unexpected discovery on a prime terrorist suspect, is highly relevant. Would it not make for an absolute prized find in the entire history of the RGP police detective fieldwork? It’s a valid question, and one that needs to be answered by the Police Complaints Board, if the board is to possess any integrity whatsoever. There is a clear case to answer here, about motives. (86) Instead of confiscating the DVD, and arresting me for being in possession of suspected terrorist material, the police officer neglectfully put the DVD down like a hot potato, and instead wasted his time searching through my notebook looking for clues that I was a terrorist, when for the most part, it was chock-full of Holy Scripture references about Christ and His Second Coming. (87) In selecting the notebook, instead of looking at the all too obvious DVD about Terrorism, he made reference to notes I had made about generators, and pumps, and looked at me suspiciously, as if I was some kind of a bomb-maker. The degree to which the male police officer probed me rigorously on this, while completely letting me get off the hook with the DVD I had in my possession, was never explained away. Therein lies the real clue about The Truth in all this. 10. Given I was caught “red-handed” in possession of a DVD about a deadly terror attack in London, on 7th July 2005, should it not have immediately aroused deep suspicion in the minds of the two police officers detaining me, and triggered an appropriate response? 11. The discovery of a DVD about terrorism, should have suddenly become an immediate priority. Instead, the exact opposite happened. The two officers, in each taking one look at the label on the DVD, duly dropped it like a hot potato, as if it were a hand-grenade timed to explode in their faces. 12. Elementary investigative questions about the DVD were simply not forthcoming, and clearly the sub-committee have abjectly failed to probe into why this was so, despite me flagging-up the issue or the 7/7 Ripple Effect 2 DVD to the Police Complaints Board, as an integral part of my complaint. 13. It follows that having made the decision to stop and search me, their basic police investigative skills in the interrogation of a potential kufi clad “terror threat” suspect, could and should have occurred. 14. That the two police officers did not pursue such a course is most revealing. QUESTION 1 – What exactly was the DVD’s content? QUESTION 2 – Why was the 7/7 Ripple Effect 2 DVD made? QUESTION 3 – Who made the DVD? QUESTION 4 – Who featured in the DVD? QUESTION 5 – Why did I have it on The Rock, especially on the National Day of Gibraltar? QUESTION 6 – How was it relevant to The Royal Gibraltar Police? QUESTION 7 – Was I planning to unleash a 7/7 bombshell in Casemates Square​? 16. Given the stringent line taken over my plain blue crocheted hat, how could it therefore also not have appeared to the sub-committee members as anything less than a dereliction of duty, on the part of the two police officers, to have not, at the very minimum, confiscated the DVD, and subsequently had it examined for crime prevention and intelligence gathering purposes? 17. Plain blue crocheted hats notwithstanding, the fact is that neither police officer asked me one single question about the DVD. Now that’s what I correctly call a massive dereliction of duty. 18. Related to the above, conspicuous by its absence, in the Police Complaints Board inept response, is any mention of the 7/7 Ripple Effect 2 DVD. This much cannot be denied. 19. The truth is that the gravity of the situation should have been self-evident to any diligent sub-committee member worth their salt. 20. It follows that had either of those two police officers been genuine in their CONTEST terror threat 4P’s power game pursuits that day, then surely their timely uncovering of a DVD found in my possession warranted a much more forceful response, than my immediate release back into the sartorially red riddled crowds within Casemates Square that day. 21. The DVD’s label visibly referred to an act of terrorism of the most appalling kind, and on that basis alone, it should have quite naturally by its own merit, elevated the status of their stop and search of me, into an instant arrest in order for the DVD to be examined, while I was still in their custody. 22. At the very least, it should have been incumbent on the two police officers to have confiscated the 7/7 Ripple Effect 2 DVD, in order to establish its contents. 23. The fundamentally important issue of how such an exhibit was deemed not germane to the original reason why I had been taken inside the police station for questioning has not been addressed. 24. Seemingly, escaping the attention of the Police Complaints Board sub-committee was the fact that neither of these two intrepid police officers showed the slightest interest in the DVD about the London Bombings where 56 people supposedly died on 7th July 2005 and 800 were injured, with many of them maimed for life. 25. Given that according to the police sub-committee, the wearing of a crocheted hat / blue kufi compels the police to become suspicious, how was this abject failure to subsequently probe me over the potentially far more threatening indicator of a terror attack DVD, not a dereliction of duty by the two officers? 26. More importantly still, what possible motives did the sub-committee possess, to deliberately avoid dealing with this deeply disturbing dichotomy, during their so-called investigations of my complaint? 27. 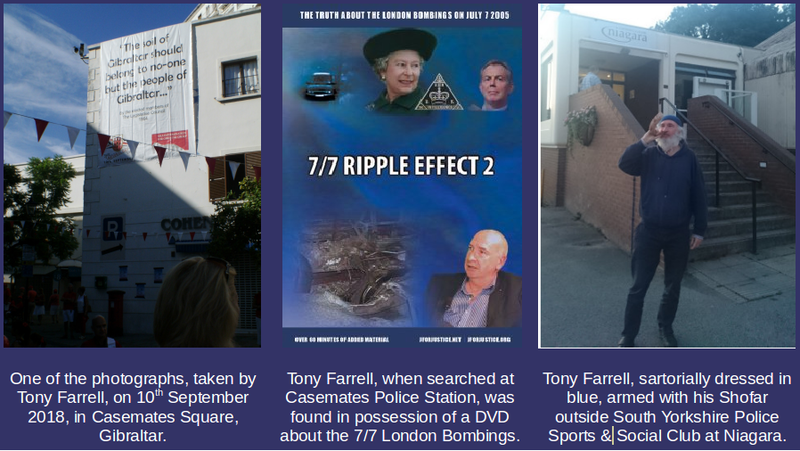 It is hereby asserted that many members of the RGP are already familiar with the contents of the 7/7 Ripple Effect 2 DVD, and they would have already known deep down that the documentary exposes the stark truth behind the terror threat scam. 28. The DVD offers compelling evidence that the terror threat construct, as promulgated by SO15, and which is currently being heavily unleashed on the unsuspecting public in Gibraltar, in the guise of Project Servator, is BOGUS. 29. Seemingly, not a single police officer in the Royal Gibraltar Police, nor a single member of the Gibraltar Police Authority, nor indeed any of the politicians in the corridors of power of government, have the moral courage to tackle this fundamental issue of truth. 30. Instead, THEY of which the Gibraltar Police Authority form a component part, by their devious “dereliction of duty” utterances, all wittingly allow themselves to become complicit in the evil police-state acts of tyranny, they fail to oppose. 31. So far at least, the very actions / inactions of the sub-committee which so ineptly examined my complaint, sadly, though not surprisingly, fall squarely into this category. 32. 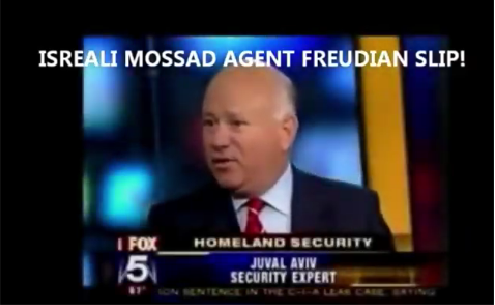 In addition to the remarkable 7/7 Ripple Effect 2 documentary which was specifically provided for your police complaint board’s enlightenment, members of the Gibraltar Police Authority are urged to watch the following admittance of 9/11 and 7/7 guilt, coming as it does from a security expert operative from Mossad, that the attacks were carried out by Mossad, NOT by Muslims. Thus proving the truth of the 7/7 Ripple Effect 2 DVD’s contents, and that the Muslim Terror Threat is BOGUS. 33. The only way to restore the integrity of the Police Complaints Board would be for the Gibraltar Police Authority to insist upon a proper examination of the contents of the terror DVD I had in my possession, and then subsequently deal with the implications of that as an integral part of my four-pronged complaint, as previously requested. 34. In conclusion, having been previously alerted to the DVD’s existence, members of the sub-committee, in showing wilful blindness to the evidence on offer within my complaint bundle, have rendered themselves fully complicit in the evil they have failed to oppose. 35. It is an atrocious and shocking indictment on the Police Complaints Board that they should side with the hopelessly hypocritical and prejudicial views emanating from the Royal Gibraltar Police’s Professional Standards Department’s shameful assessment of my attire on the day. 36. My attire has been labelled by them as incongruous, with full unadulterated endorsement by the Police Complaints Board. 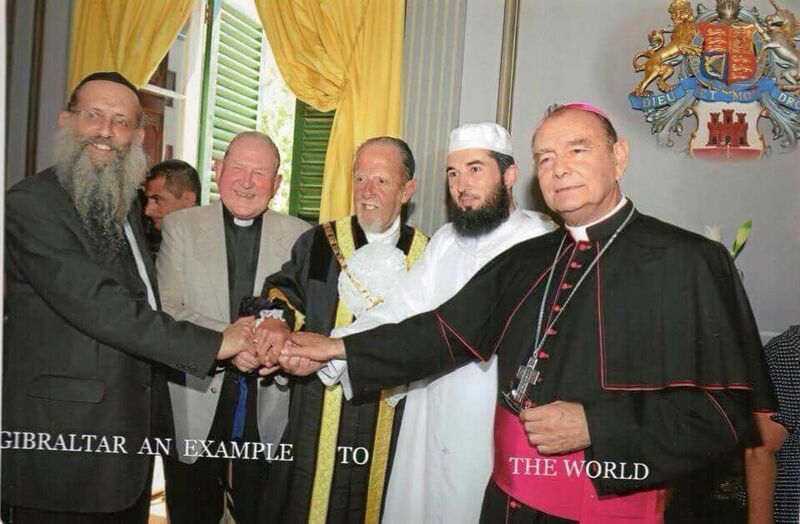 It is nonsense, and makes a mockery of this familiar image below, about which the Gibraltar Government prides itself. 37. It is hypocritical because, on July 2018, shortly after arriving in Gibraltar for the first time ever, I introduced myself as a former police intelligence analyst to Sgt John Olivera and PC Scott Strachan (both have since been promoted) at a recruitment / promotional event. My attire then was much the same as on National Day. 38. Neither promoted police officer felt the need to question my attire. Sgt John Olivera even encouraged me to send my CV to him, which I duly did. 39. Prior to National Day, numerous morning vigils were spent outside New Mole House Police Headquarters. This was in protest at the RGP’s earlier unwarranted and wholly unwise confiscation and subsequent theft of Christ’s motor vehicle. Not once did any of the many police officers encountering me on my vigil, see fit to question my attire. 40. Not once did any police officer see the need to search me. At all times, police officers who approached me were perfectly friendly with me, and for the most part, I was impressed by their friendliness and approachability. One friendly police officer even invited me inside for a chat and a cup of coffee. 41. On several occasions prior to National Day, under the guise of Project Servator, police officers had approached me in various locations throughout Gibraltar. All this was done in a friendly manner and police officers amicably explained what they were doing. The engagements were mutually welcome. 42. On a few occasions, Commissioner Ian McGrail and former Assistant Commissioner Richard Mifsud undoubtedly noticed me, but they never saw fit to advise me about my incongruous dress sense, despite being given every encouragement to do so. 43. Even when a mere few days before National Day, when I voluntarily handed myself for arrest for previously committing an offence under The Terrorism Act, two police officers named Detective Sergeant Riley and PC Manfred saw fit not to arrest me, and not to advise me on my sartorial dress-sense. 44. Contrary to what the so called professional standards of the RGP and the sub-committee of the Police Complaints Board may prefer to think, there was nothing whatsoever incongruous about wearing plain blue colours as part of one’s normal sartorial dress-sense. 45. Where does it say wearing the colour blue on the Gibraltar national day is a potential criminal offence, please? 46. If wearing blue is offensive, why do the RGP not go on the record to warn people first under Project Servator of the heightened risk they would face should they go against the flow and dare to deviate from the ruddy red dress code of the day. 47. There was nothing whatsoever incongruous about wearing a blue kufi as part of following The Way of Christ, as taught in Holy Scripture, including The Old Covenant, The New Covenant and The Holy Koran. 48. There was however something deeply prejudicial, and extremely incongruous, about the full and exaggerated endorsement the sub-committee actually gave to the discriminatory actions of the two police officers on Gibraltar’s National Day. 49. It should be noted that many people from a variety of different religious persuasions including both Christian, Muslim, and Jews regularly wear kufi hats in hot climates. This fact makes a nonsense of the Police Complaints Board’s decision. 50. 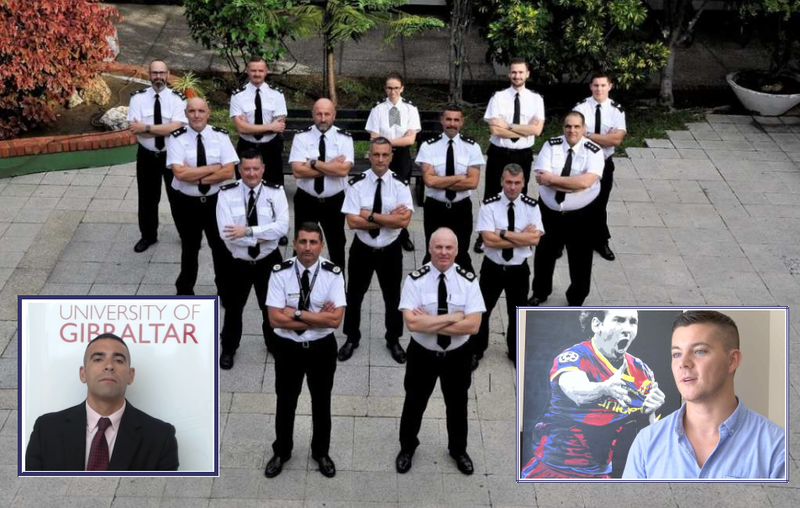 The actions of the two police officers, and the subsequent endorsement given to them in support of their actions, are incongruous with the above image that Gibraltar prides itself on. 51. Furthermore, the actions of the two police officers, and the subsequent endorsement given to to them in support of their actions are incongruous with the views expressed to me by Elka Hanglin, when a day or so after National Day, wearing the exact same attire, I asked her, did I in any way shape or form look like a Muslim Terrorist. She immediately replied with a resounding no. 52. The only thing that’s incongruous about this is the perverse decision-making of a rubber-stamping Police Complaints Board, protective of the reputation management of The Royal Gibraltar Police. 53. If this is the standard by which police complaints are investigated, then small wonder that most complaints against the RGP are not upheld. The prejudicial imposition of unaccountable power knows no bounds. 54. To repeat, there was nothing whatsoever incongruous about wearing a kufi to help protect my body’s follicle challenged head from the noonday sun. 55. The Police Complaints Board’s sub-committee’s decision-making, concerning my attire on the day, was predicated on the very same perverse and prejudicial views evidently held by two serving Royal Gibraltar Police officers, indoctrinated under the guise of SO15’s Satanically inspired Project Servator. 56. The conclusion is inevitable. The sub-committee’s decision is both perverse and discriminatory on grounds of my religious and / or philosophical beliefs. 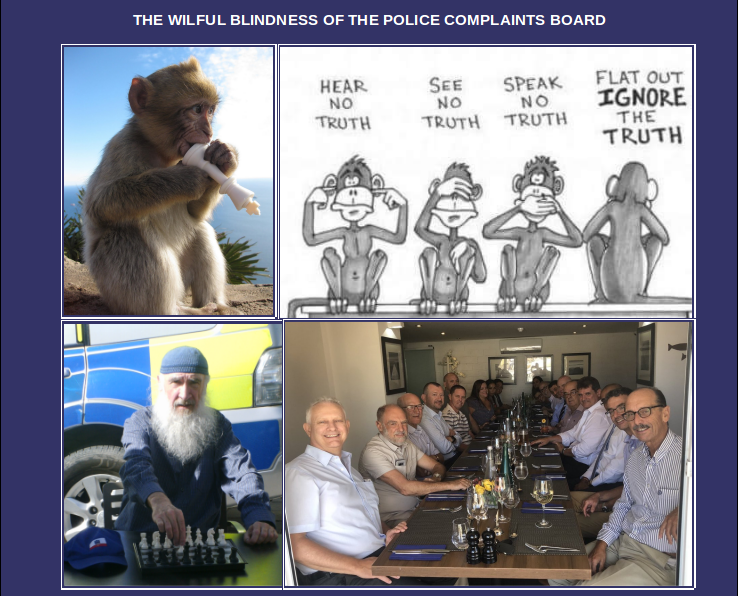 REASON 4 – The Police Complaints Board have been manifestly wrong to fail to consider my extremely serious and related allegations about the prejudicial profiling of the Royal Gibraltar Police. 57. In the lead-up to The Gibraltar National Day, a series of extra-ordinary attempts were made to help the Royal Gibraltar Police awaken from their slumber, and come to terms with the vile nature of the Strategic Terror Threat, copied from S015. 58. 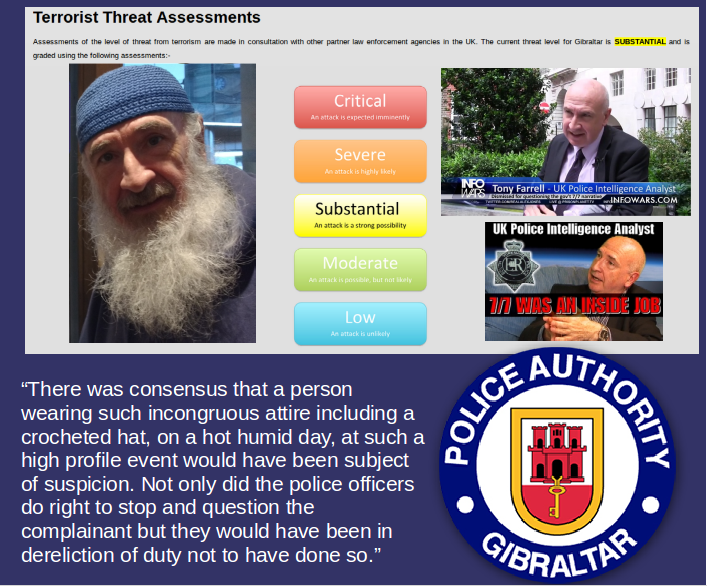 Repeated alerts were given to senior members of the Royal Gibraltar Police about their misguided perceptions about the farcical terror threat construct. 59. On 3rd May 2018, Christ first wrote to Ian McGrail, about a previous personal and private wrong his predecessor had done to Him, in the hope that Ian would sensibly use his authority to rectify matters. Disappointingly, the Commissioner did not even reply to Christ. 60. After myself being sent by Christ to Gibraltar for my first time on 28th July 2018, I met up briefly with Sgt John Olivera and PC Scott Strachan on 1st August at The Time Out Café. I introduced myself as a former police intelligence analyst and whistle-blower over the bogus terror threat construct, and I must say that my first impressions of these two recently promoted police officers was favourable. 61. In an open letter to Ian McGrail and Sgt John Olivera, dated 2nd August 2018 entitled, “Commissioners on The Rock”, I submitted a Strategic Intelligence Assessment containing eight recommendations for the Commissioner, regarding how best to protect the interests of Gibraltar and the people of Gibraltar, during these end-times. 62. Superintendent Wayne Tunbridge spoke to me on a couple of occasions, but he indicated that he did not take kindly to my 95 Theses about Elizabeth Battenberg, who does much evil in The Sight of The Lord. 63. My guess is that speaking such truth to power is not that customary within the Royal Gibraltar Police, but during my training as a strategic intelligence analyst, I never forgot the advice I got about the profession: “Yours are the reports that ought to keep your chief constables awake at night”. 64. 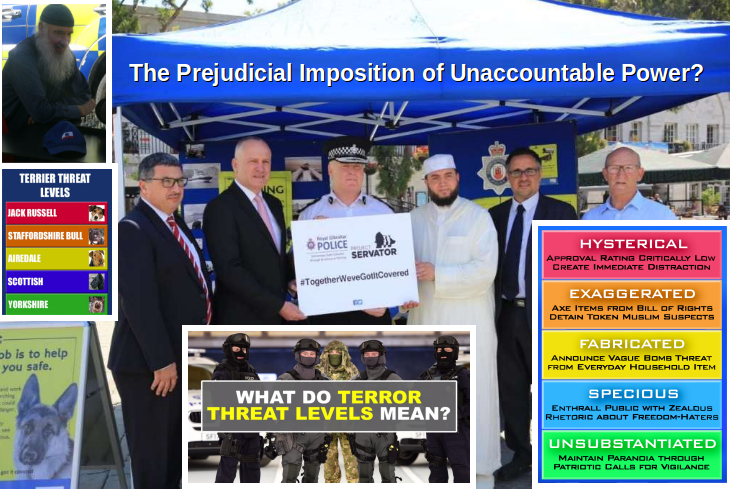 After I received no response from the Commissioner Ian McGrail, in an open email addressed to his deputy, Richard Mifsud, dated 15th August 2018, I reminded Richard of some of Ian McGrail’s Peelian Principles, and simultaneously provided evidence to strongly support the notion, that the Manchester Arena event was nothing but another one of a long line of evil police-state sponsored false-flag attacks in the UK. 65. This was invoked after Richard had glibly tweeted unwittingly or otherwise, falsehood and propaganda about the Manchester Arena stage-managed terrorist attack. 66. On 23rd August 2018, in an open letter addressed to the former assistant commissioner Richard Mifsud entitled “Semper Recte Facimus”, I could hardly have given a clearer message about the fabricated police-state-sponsored terror threat. 67. On the afternoon of Friday 7th September 2018, having historically committed an offence under the Gibraltar Terrorist Legislation, I voluntarily handed myself in for arrest at New Mole House. 68. Interviewed by Sgt 27 Riley, and PC 153 Manfred, when confronted with my Statement of Truth entitled: “TREASONABLE CAUSE”, the two police officers declined to arrest me, but instead took away my statement of truth for police records. 69. The “Treasonable Cause” statement of truth was duly published on JAHTALK, and later, after the “weird” events of National Day, I flagged the same up for the Police Complaints Board in support of my complaint against the police actions on 10th September 2018. 70. Had The Police Complaints Board investigated my complaint fully, utilising all the material and references I provided for them, then the sub-committee could and should have rigorously challenged the Police Commissioner Ian McGrail, over the terror threat level and the real and sinister underlying motives of the emergency services terror drill exercise, on 29th November 2018. 71. In this case, silence isn’t golden. It’s yellow. 72. 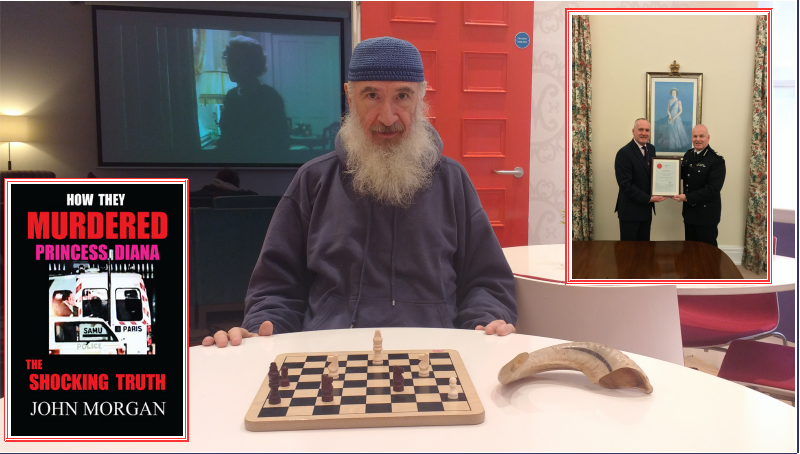 On 5th February 2019, on my way to an appointment with the Methodist Minister Fidel Patron, I was yet again stopped by police outside a nearby tunnel to the Gibraltar Police Authority Offices, where a team of five officers were visibly on Project Servator duty.Their engagement with me was friendly enough, but it made me late for my appointment. During the meeting with Fidel, brief reference was made to the Casemates Square incident on National Day, the progression of the complaint, my dissatisfaction with the Police Complaints Board decision, and the Project Servator incident earlier that morning. 73. Left with Fidel Patron was a Strategic Intelligence Analysis document entitled China’s Trojan Dragon. Fidel was told that the other copy in my possession was for the Chair of The Police Authority, and that 20 of Gibraltar’s strategists had already been given copies. 74. Shortly after the completion of my meeting with Fidel Patron, I spoke very briefly with Ian McGrail in Main Street. I was informed that he had not seen the SIA, and suggested that it had been filtered. 75. With respect, if that is so, then his administrative team are doing him a huge disservice. It’s either that, or he wants to have the “plausible deniability” card up his sleeve at some future point in the future, when the proverbial hits the fan. 76. It is recommended that Joey Britto overturns the decision of the Police Complaints Board Sub-Committee. 77. It is recommended that a joint meeting be held between Joey Britto, Fidel Patron, Ian McGrail, Christ, and me to discuss the enormous ripple effect implications of the complaint. This Statement of Truth details a complaint I wish to make against the conduct of a male police officer PC 201 and a WPC 198, both from the Royal Gibraltar Police. My complaint concerns an incident which occurred in Casemates Square on National Day 10th September 2018. This occurred when I was inappropriately stopped, questioned and then subsequently detained and searched at the nearby police station in Casemates Square. The event in question occurred between 10:45hrs and 11:45hrs on 10th September 2018. This is what happened of relevance during that time interval. While in Casemates Square, experiencing for my first time, the cultural celebrations taking place on Gibraltar’s National Day, I was stopped by two police officers from The Royal Gibraltar Police. I had merely been taking one or two photographs on my video recorder so as to capture the essence of what was for me, a-never-before-seen occasion. I had arrived in Casemates with the intention of staying for an hour or so, just so as to listen to the National speeches and gain some better understanding of the Gibraltarian culture. It was never my intention to participate in the wider traditions of National Day, but the subject interests me, so I had been looking forward to observing some highlights of the occasion, just for an hour or so. I had been wandering around Casemates Square for twenty minutes of so, observing and enjoying the happy atmosphere and entertainment. I was struck by how everyone seemed in a good mood, and noted the mass of red and white colour. A handful of photographs had been taken of the occasion. Since I wasn’t sure exactly where the keynote speeches were to take place, and what time they were scheduled to start, as we are taught as children to do, I asked a police officer on duty in the square. I was basically told that yes, I was in the right place, and when the speeches would start. Shortly after that, while walking in front of a GBC stall, I noticed a former work colleague of mine, whom I hadn’t seen for donkey’s years. This was the GBC radio host presenter named Lucinda Snape. She was obviously on duty, live on air. As I didn’t want to disturb her, or distract her from her broadcasting duties, I waited for an opportune moment, and then, I merely caught her attention, said hello to her with a friendly smile, and put my thumb up to her saying, “Nice one, Lucinda!”. Lucinda recognised me and smiled saying my name. After that, I started moving towards the big stage to get a closer look at some of the entertainment on display. At that point, there was a sudden tap on my shoulder from behind. To my surprise, it was a male police officer accompanied by a female police officer. I think that the male officer was the same officer who had moments before informed me about the location of the National Day speeches. The male police officer started to ask me questions, but as it was extremely loud outside, we went round the corner through some archway and stood near a Pizza Place, where we could better converse. As it was hot, and I had been walking for a while, I asked that if we were to chat, could we sit down via a nearby bench. I think from recollection that I was allowed to sit. The male police officer then started to ask me some private questions, without initially explaining why he had approached me from behind. I was asked my name and so I gave it as Tony Farrell. I was asked why I was here, and so I indicated that I wanted to watch what was going on during the National day, indicating that it’s the first time I have seen and experienced the occasion, as I am still relatively new here. I said, “Yes, of course”. So he mentioned something about the terror threat facing Gibraltar from overseas, seemingly as his justification for stopping me, and asking me questions. In a series of quick-fire questions, the male police officer then proceeded to ask me what I was doing in Gibraltar. So I answered correctly and indicated that I was sent here. I responded by saying that I haven’t actually been told in specific terms what exactly I am here for. I replied that I was sent here by JAH. He asked me Who is JAH. I replied that JAH is my boss. While the answer is correct, a much superior answer, could and should have been given. I should have said, “JAH is Christ, in His Second Coming”. The male police officer did not seem especially happy with the answer given, and so I was then asked what I do. I indicated that it’s kind of complex to explain, but it’s all on my JAHTALK website, if only he’d care to look. Again the male police officer indicated that he was not happy with that answer. He asked me how did I get to Gibraltar, and I provided answers. I was asked again, Who is JAH. In pausing for a moment, to think of how best to answer, I indicated that that would take quite some explanation, but again, I said, it’s all very well-documented on my website. That is quite correct, it is well-documented, but upon reflection, a second opportunity was missed by me to give the police officer the best possible answer which would have been as follows: “JAH is Christ, in His Second Coming”. I did not say that, but I know now that I should have done, and regret not having done so. So for a third time, I indicated that the real answer can be found on my website, and while elaborating a bit further, a third opportunity was yet again missed by me, to give the two police officers the unequivocally best and most accurate answer about JAH being Christ. I now have to answer to Christ for that failure of mine to be explicit. The police officer asked me where is JAH now. I answered that I don’t know. That was a correct answer. I was asked about how long am I intending to stay in Gibraltar. I said that that pretty much depends on what JAH requires from me. Again that was an entirely accurate answer, although it would have been a better and clearer answer had I used the name Christ rather than JAH. With hindsight, I regret not answering like that. I was asked various other questions about my situation in Gibraltar, and so I gave answers. The male officer accused me of being evasive, and said that he was not happy with my answers. The male police officer then also suddenly accused me of being nervous. I replied that I didn’t feel nervous. He said, “You are, you are visibly shaking”. I looked down at my body’s hands and arms and I could not see them shaking, so I gently replied that I didn’t accept that I was shaking. I considered here that the male officer was making a false accusation in an attempt to unsettle me. By this time, I sensed that the male police officer had made up his mind not to be friendly with me, and I was now convinced in my own mind that he was deliberately firing false allegations against me, in an effort to unsettle and provoke me. At some point around this time, the police officer was trying to claim that I said that I’d only been here in Gibraltar for a day. Believing him to be deliberately trying to fluster me, I informed him that he must have misunderstood me. I clarified that I was seeing the Gibraltar National Day for the very first time, but in actual fact I’d actually been here in Gibraltar since July 2018. He asked me to show him what was in my pockets. While I was by now, under the distinct impression that his engagement was intimidatory, I fully co-operated with the request, and in an effort to be helpful, without any fuss whatsoever, showed the police officers my wallet, its modest contents, my passport, and my video recorder. At that point, I was informed that I was required to accompany them to the police station for further questioning. I merely complied without even asking why. 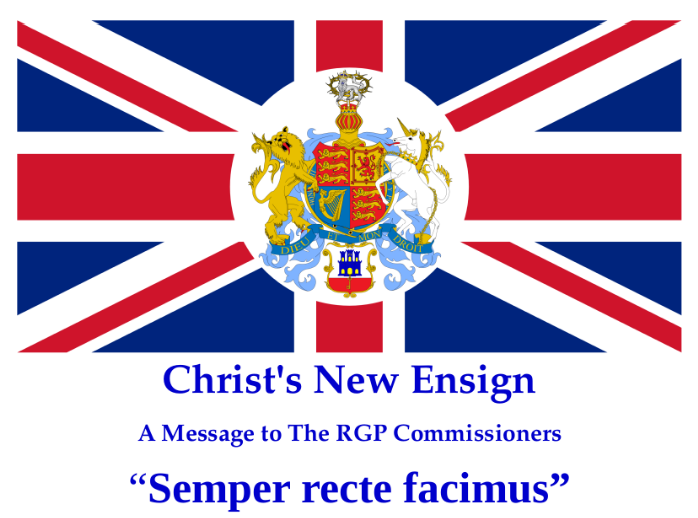 As one of Christ’s disciples, I could and should have questioned the Sovereignty and Jurisdiction, but I confess plainly that I failed to respond correctly for The Lord, when such an opportunity arose to Challenge the Sovereignty and Jurisdiction of the Crown, and thus the Governor, RGP and Judiciary, all of whom are acting fraudulently/criminally in claiming an authority they do not possess, because their authority comes from a fraudulent/criminal monarch/crown, and fraud vitiates EVERYTHING, and thus the unlawfulness of the Police Officer’s pretended authority and orders made to me at that particular moment in time, and his unlawful detention of me and invasion of my privacy. The fraudulent/criminal monarch cannot delegate a lawful authority that she does not herself lawfully possess, and no law-breaker/criminal can be a law-enforcer. Meanwhile, on our way to the police station, when I saw a homeless person whom I knew, sitting not a few feet away from me, I was prevented from engaging with him. I was instructed to proceed towards the police station. Erroneously, in The Sight of The Lord, I complied. In The sight of The Lord, the male police officer had no authority or Jurisdiction over me. As a Disciple of Christ’s, I could and should have explained this to the two police officers. I regret not doing so. As I made my way with them to the police station from under the archway, just as we came into full view of the large crowd, the male police officer suddenly placed his hand on my shoulder from behind me, as if to show all and sundry in Casemates Square that they’d just apprehended someone who fit their conceptual models of what a Muslim Terrorist might look like. Perhaps to the red and white masses in the square, this would be wrongly perceived, as a highly visible incident under the guise of Project Servator, as an act of terrorism, that the Royal Gibraltar Police had just thwarted. Doubtless, to the unsuspecting masses, this would be wrongly perceived at first glance as an act of police public protection and crime prevention at its absolute finest. In truth, the exaggerated actions of the male police officer were done merely for show: playing to an audience. Such actions were completely unnecessary. No arrest had been made and no threat was posed by an innocent bystander – me. Of course, a forceful hand placed on the shoulder of a so called Muslim Terrorist lookalike would serve the RGP very well indeed in countenancing the perpetuation of the bogus terror threat construct. For sure, the male police officer’s actions ticked all the right boxes. This was highly visible. This was reassuring to the public. This would help greatly reinforce the inherent bias in the public’s mindset about the phantom menace from abroad, all in one fell swoop. It was outright street-theatre, bold and brilliant. This was all done at my expense. It was totally unwarranted. No threat was posed and no unfriendliness had been shown, and I am not a Muslim, and obviously neither African nor Asian: I am English. Whoever, or whatever they thought I was, and I had told them my name, and how to find out exactly who I was, only someone with a prejudicial brainwashed mindset and jaundiced eyes, could equate my neat and tidy appearance with that of the so-called “Mad Mullah” stereotypical Muslim terrorist. Inside the police station, I was duly asked to stand up and a search was performed. My passport, wallet, driving license and video recorder were examined. Also in my pockets was a little notebook and one other vitally important item, which I shall come to later in paragraph number 77. Regarding my notebook, my personal details were read from cover to cover, and an inquisition was held, as if I was a guilty terrorist plotting to blow up the square. When the male police officer saw the name “Richard Mifsud” written in my notebook, he gasped and immediately zoomed in on that golden nugget. I was duly asked about the identity of Richard Mifsud. So when asked to explain who he was, I replied that I thought he should know that he was the male police officer’s police force’s deputy commissioner. Looking somewhat puzzled, the male police officer asked me why his name was written down in my notebook. I proceeded to explain that it was because I had been writing to him over the last few weeks, as likewise I had been writing to Superintendent Wayne Tunbridge, while also simultaneously engaging a little bit here and there with Sgt. Philbin, Sgt Olivera, PC Strachan, Sgt Riley, and his police constable accomplice named after Manfred Man of “Blinded by the Light” fame, and, just for good measure, I threw in the fact that top of cops on my communications list was the Commissioner Ian McGrail. With reference to Sgt Riley and PC Manfred, I let the officers detaining me know that I had made some sort of important disclosure under the Terrorism Act, only a few days earlier on Friday 9th September 2018. The mood changed in a flash. A somewhat startled male police officer, then asked me again who I was. Both officers were then told that I was Tony Farrell, but this time I added that I am a former Principal Intelligence Analyst of South Yorkshire Police. The male police officer asked me why did I not tell him that in the first place. So I replied that I had repeatedly tried to tell him that my details could all be read on the internet, if he only had cared to look, and listen to me, and that it’s rather a complex situation to try to explain in a simple one-line response, when he was demanding overly simplistic answers. The male police officer, in now appearing to defend his actions, pointed out that I had been wearing a “hoody”, even though the climate was hot and humid, as if this was a crime, when millions of people wear hoodies. It was perfectly true, that it was hot and humid, I warrant. However, that was no reason to suspect me of anything. I simply nodded, and agreed about it being very hot. However, just to be clear about the clothes being worn, the actual clothes that this body of mine was wearing on the day, consisted of a navy blue crocheted hat, a navy blue top with a hood, navy blue trousers, and navy blue shoes. There was no insignia anywhere. It was just plain old fashioned blue. The body looked clean and respectable, and my conduct had at all times been courteous and polite. The attached photograph shows me in almost identical attire elsewhere. The body normally gets dressed in bluish colours as a matter of course anyway, but on this occasion, it was deliberately dressed all in blue, because blue is God and Christ’s colour, whereas red is Satan’s colour, as written clearly in Scripture (Rev. 12:3)2, and Casemates Square was awash with it. In no way can the wearing of plain blue be remotely construed as offensive to anyone. After-all Gibraltarians claim to be British and staunchly proud of it, and the British colours are red, white and BLUE, and I was adding some BLUE. If ever there was a stark example of Project Servator’s Satanically inspired intent at work, then this, I am afraid, was it. Following the RGP’s engagement in late 2017, with the utterly corrupt and evil S015 from the Metropolitan Police, I was mindful that my blue attire and my longish white beard might possibly catch the eye amidst a sea of red, but looking a bit different from the norm, was surely not a valid reason for preventing my entitlement to enjoy the occasion peacefully and respectfully, as I was doing. Those two RGP police officers, who have evidently allowed themselves to be brainwashed into believing a totally false and fabricated terror threat narrative, in a continuation of “Operation Gladio” and the “Strategy of Tension”, need to take note. You ALL need to research into and study “Operation Gladio”, and Muad’Dib’s “7/7 Ripple Effect 2”, should be made compulsory viewing in police training. That way the RGP will be able to see through the propaganda lies in order to discover the truth that’s being hidden from you, to keep you afraid, cowed and compliant. In a spiritual sense, I believe God The Father arranged this incident to happen, in order to provide a perfect illustration of the degree to which the Royal Gibraltar Police has succumbed, and has been hopelessly indoctrinated into believing the lies about such terror threat falsehoods. On that score, my own initial prior conceptual model of their bias, based on my training and experience as an intelligence analyst was duly confirmed, and the prejudicial brainwashing of the male police officer, collar number 201, in particular, was unequivocally demonstrated beyond doubt. During the early stages of my detention, false accusations were made that I was nervous and evasive. If I did indeed come across as nervous, which I deny, I could claim that it was possibly because it’s not every day one gets stopped and searched, and especially in such a hostile, confrontational way. If I appeared evasive at times, which I won’t necessarily deny, then I attribute that to my own severe shortcomings in serving as a Disciple of Christ, and letting Him down badly by not making it crystal clear to the police officers involved, that in actual fact, I was working for Christ, Who is here on Earth right now, in His Second Coming. JAH is Christ: doubt it not. To the police officers in person however, I ineptly explained that I was merely pondering how best to answer the quick-fire questions, as my situation is rather unusual, and very different from the norm. As far as Christ is concerned, for Whom I work, this was a rather displeasing performance from one of His Disciples, in certain aspects. Continuing with the detention, I was duly asked whether I spoke Spanish, and I replied that I didn’t. Given the list of RGP police officers I’d previously name-dropped before the male police officer, the WPC then proceeded to make some phone calls, to seemingly verify if what I had told them stacked-up. From the gist of the phone calls, it plainly did. I was duly informed that Special Branch wanted to speak with me, but the female police officer indicated that they would only want to keep me for five minutes or so. By now, the atmosphere was no longer frosty, or threatening. In actual fact, I was quite looking forward to the unexpected prospect of having a chat with Special Branch Officers on National Day. I recall at some stage asking for clarification about whether I was under arrest. Obviously, at no stage did I think I was, but I just wanted to be sure. The police officers confirmed that I was not under any arrest, but they said that the details of my short detention and stop and search, would go on record. During the course of waiting for the arrival of Special Branch, I was kindly given a couple of bottles of cold water to drink. The atmosphere became increasingly more pleasant in the station, and I confess plainly that I was starting to enjoy myself. More phone calls were being made in Spanish and in English while I sat waiting. Hearing the conversations, especially the ones in English, I got the impression that the WPC was having to try to defend their decision as to why they had detained me, and wasn’t finding it easy to justify. I also got the impression she was being reprimanded by a superior. In defending their actions, I heard the woman police officer use the word “weird” on the phone. While waiting for Special Branch to arrive, I mentioned in conversation that just before they had engaged with me, I’d seen someone at the GBC stall whom I had not seen for donkey’s years, who had been part of my team of senior intelligence analysts that worked under my supervision. I asked them had they heard of her by name. Neither police officer had heard of the person in question, saying they don’t tend to listen to the GBC radio station during those particular broadcasting hours, because of shifts, etc. The WPC invested some time looking through my video recorder. She asked me if I was Catholic. At the time, I did not realise why she was asking me that, but I simply said, “No, but some of my body’s family are.” When I was given back the recorder, it then dawned on me, that she’d seen some photographs taken of graven images inside some of Gibraltar’s idolatrous Catholic Cathedral and churches. Early on in the search, the male police officer looked closely at the front cover of the DVD, and read its title, but abjectly failed in his duty to ask me a single question about it. The question has to be asked, “Why not?”. After all, this was a DVD about terrorism, and mass murder, and what is more, I had been caught red-handed with such an item in my possession. Here’s the clincher. Had the police officers’ motives been in any shape or form genuine, did they not have a duty of care to the public, under Project Servator, to probe me about the DVD and its contents, with at least the same rigour as they had probed me on other such matters of a private and personal nature? Their abject failure to exercise that duty of care to the public, given the initial nature of the stop and search they were supposedly performing on me, demonstrates the sheer hypocrisy and folly of Project Servator’s facade, all in one fell swoop. For, just like Muad’Dib’s film had exposed the false narrative behind the false-flag 7/7 London Bombings of 7th July 2005, so too did His DVD label now shine The Light on Project Servator’s disingenuous objectives, and the false terror threat sham laid bare before the two RGP police officers. Given that I’d been stopped and then brought into the station specifically because of the terrorism threat, it seems very ironic indeed, that, when the male police officer, who caught me red-handed possessing a DVD specifically about terrorism, and terror attack bombings in London, somehow and in some way, saw fit to completely disregard its relevance to the reason for my detention. Why did neither of the police officers examine the content of the DVD, if they genuinely stopped me because of the terror threat? Why did the police officer not arrest me immediately upon seeing this DVD, on suspicion of possessing terrorist material? Surely such an unexpected discovery on a prime terrorist suspect, is highly relevant. Would it not make for an absolute prized find in the entire history of the RGP police detective fieldwork? It’s a valid question, and one that needs to be answered by the Police Complaints Board, if the board is to possess any integrity whatsoever. There is a clear case to answer here, about motives. Instead of confiscating the DVD, and arresting me for being in possession of suspected terrorist material, the police officer neglectfully put the DVD down like a hot potato, and instead wasted his time searching through my notebook looking for clues that I was a terrorist, when for the most part, it was chock-full of Holy Scripture references about Christ and His Second Coming. In selecting the notebook, instead of looking at the all too obvious DVD about Terrorism, he made reference to notes I had made about generators, and pumps, and looked at me suspiciously, as if I was some kind of a bomb-maker. The degree to which the male police officer probed me rigorously on this, while completely letting me get off the hook with the DVD I had in my possession, was never explained away. Therein lies the real clue about The Truth in all this. At some point soon after the WPC had completed her phone calls, a convivial looking Ian McGrail waltzed through the door, immediately saying hello to and smiling at me, and then instantly speaking privately with the WPC, out of my sight. Soon afterwards, the WPC came back and I was immediately told I was free to go. No mention was made of my appointment with Special Branch. Goodbyes and good wishes were said to both officers. By the end they had become quite friendly with me. Release time was before midday. Free outside the station, I decided not to listen to the National Day speeches after all, as I felt it best to notify The Real Protector4, JAH/Christ by email of the Madness of Casemates Square. Upon receiving my account, a few day’s later, Christ expressed His displeasure with me, that one or two of my answers to the police officers had fallen far short of what He would have expected from a Disciple of His. That’s a matter for me to address with Christ and Father, directly on an ongoing basis. 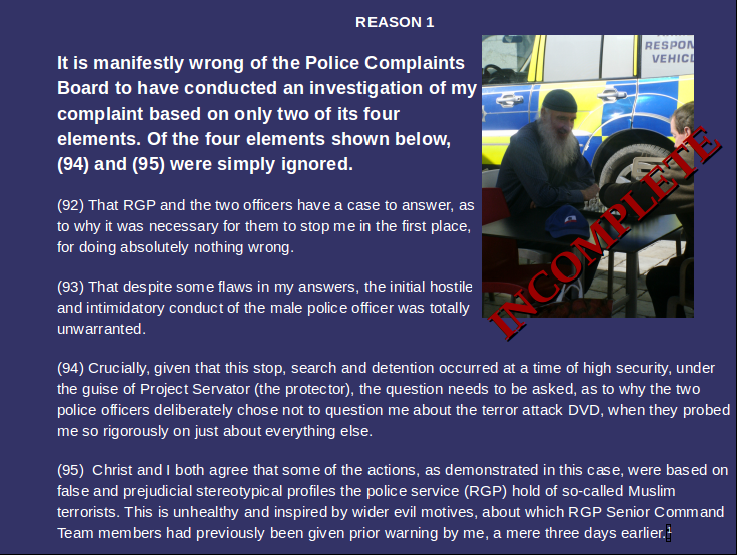 That RGP and the two officers have a case to answer, as to why it was necessary for them to stop me in the first place, for doing absolutely nothing wrong. That despite some flaws in my answers, the initial hostile and intimidatory conduct of the male police officer was totally unwarranted. Crucially, given that this stop, search and detention occurred at a time of high security, under the guise of Project Servator (the protector), the question needs to be asked, as to why the two police officers deliberately chose not to question me about the terror attack DVD, when they probed me so rigorously on just about everything else. 2 Revelation 12:3 And there appeared another wonder in heaven; and behold a great red dragon, having seven heads and ten horns, and seven crowns upon his heads. 4 Psalm 18:2 The “I AM” [is] my rock, and my fortress, and my deliverer; my God, my strength, in Whom I will trust; my buckler, and the horn of my salvation, [and] my high tower.